We welcome to the blog a guest post by Sandra A. Gutierrez, author of Beans and Field Peas: a SAVOR THE SOUTH® cookbook. Robust and delicious, beans and field peas have graced the tables of southerners for generations, making daily appearances on vegetable plates, sideboards, and lunch counters throughout the region. Indeed, all over the world, people rich, poor, or in between rely on legumes, the comforting “culinary equalizer,” as Gutierrez succinctly puts it. Her collection of fifty-one recipes shines a fresh light on this sustaining and infinitely varied staple of ordinary life, featuring classic southern, contemporary, and international dishes. In today’s post, Gutierrez shares a delicious selection from her cookbook—perfect for a hot day!—along with anecdotes about her yearlong obsession with beans and field peas. I was thrilled to have been invited to write this book, Beans and Field Peas: a SAVOR THE SOUTH® cookbook published by the University of North Carolina Press. I seldom get the chance to immerse myself into the study of a single subject for a long period of time. 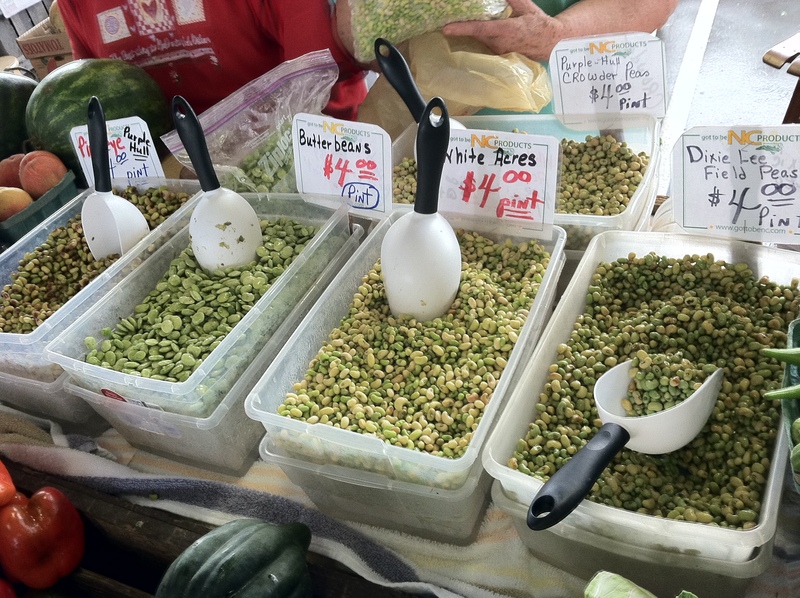 In this case, legumes in the form of beans, field peas, and green beans offered me an opportunity to investigate and retrieve their historical origins, extoll on their cultural importance in the foodways of an entire region, and put them into a global perspective. For over a year, beans and field peas became my obsession. I sought them in farmers’ markets all over the South, bought them at farm stands by the roadsides as I traveled, and cooked them for breakfast, lunch, and dinner! I read about them, talked about them, wrote about them, ate them, and even dreamed of them. I jokingly like to say that it took a Latina to write about the importance of beans in the South. After all, beans have been part of my life since childhood, from the little black beans that made it to my family’s table every week, all the way to the beautiful, thin, and crispy haricot verts that I learned to julienne and cook in butter as a young girl. However, that’s only part of the reason why I was happy to take on this project. Truth be told, the subject of field peas really clinched the deal for me. Field peas in all of their glory were, for the most part, unknown to me when I moved to North Carolina thirty years ago. Surely, I had enjoyed plenty of bowls of rice and pigeon peas (which I knew as arroz y gandúles), and certainly gobbled down platefuls of black-eyed peas and lima beans in my lifetime. However, the gargantuan array of southern field peas was a discovery to me. I marveled at the different colors of the field peas, from lime-green butter beans and purple peas with white specks, to golden yellow-eyed peas. I rejoiced in the textural differences between a creamer and a crowder pea, one velvety when cooked, and the other retaining a slightly more toothsome quality. Finally, I delighted in the varying pot likkers that each kind produced. Then of course, there was the matter of exposing true southern green beans that get better the longer they’re cooked. I don’t mean the dark green, bean-less, and hollow variety of Blue Lakes that we find in modern supermarkets today. I mean those that grow in the gardens of southerners, on poles or in bushes: greasy beans, Kentucky wonders, white or green half runners, and other pods. I mean the kind that bulge with immature seeds inside and that rupture when cooked long and slow, allowing said little beans to escape into the likker while yielding a good dose of protein and delightful textural contrast. It is my hope that you too will delight in the world of southern beans and field peas and that you learn to cook them the southern way, the new-southern way, and the international way, so that your table is always brimming full of healthy and succulent goodness. Place the beans in a pot and cover with water by 2 inches. Bring to a boil and cook for 5 minutes, skimming off the foam that rises to the top; cover, reduce the heat, and simmer for 35-40 minutes or until tender. Meanwhile, fill a bowl with iced water. When the beans have finished cooking, drain and immerse them in the ice batch until cool. Drain the peas and transfer them to a large bowl; add the corn and tomatoes. Recipe from Beans and Field Peas: a SAVOR THE SOUTH® cookbook by Sandra A. Gutierrez. Copyright © 2015 by Sandra A. Gutierrez. Sandra A. Gutierrez is the author of Latin American Street Food and The New Southern–Latino Table. A well-known culinary instructor, she lives in Cary, North Carolina. Her book Beans and Field Peas: a SAVOR THE SOUTH® cookbook is now available. Connect with Gutierrez by visiting her website Sandra’s Kitchen Studio or following her on Twitter @sandralatinista. Don’t forget to “like” the Savor the South® page on Facebook for more news and recipes.